Every night when I am going to bed, I put my forehead on Madeline’s urn and I talk to her. I end every conversation by saying, “Please come see me in my dreams.” I not-so-secretly hope that I’ll get a glimpse of her of how she would be if she were still here and five years old, but that hasn’t happened. Unfortunately, I can count on less than one hand how many times I’ve dreamed about her, and of those dreams, the majority have been replays of memories, like watching one of the videos I have of her on repeat. Until these last few days, that is. I’ve had some extremely vivid dreams about her, and they have all been horrible. I struggle to wake from them, and when I finally do I am terrified, confused, and sick. In the mornings, I feel like a shell of myself. I’m unsettled and anxious all day. If I had to choose between only having these nightmares or never dreaming about her again, I would choose the latter. I think about death a lot. Well, not a lot per se, but probably more than a typical thirty-three-year-old. Death has impacted my life a lot in these last four years. I think about Madeline’s death, and how frantic and horrible it was. Everyone in the hospital room was agitated and terrified. Was she? I don’t know. I hope not. I wish I could have held her when she died. Would that have made it less horrible? No. But maybe it would have been a little more peaceful, a little more calm. But it’s done, I can’t change it. It still would have been the worst day of my life. And I think about Jackie’s death. She died at home, surrounded by love. But it was still horrible, because she was leaving. But I don’t have nightmares about her. There’s no good way to die, but there are better ways than some. I’m so tired, and my hormones are crazy. Everything feels exaggerated and difficult. I am going through a perfect storm of stressors that are contributing to this vicious cycle, and getting ready for a new baby is emotional even under the best of circumstances. I know this will pass, I just hope it’s soon. I know the things I need to do to manage my anxiety and grief. I’m changing my night routine, finding ways to trick my mind, stuff like that. But also, I just need to let myself have a really, really good cry. Yo Ho Let’s Go!Yo Ho Let’s Go! I’m so sorry you have to live with these memories of Maddy’s last moments. You gave her so much love in her life, so I can’t imagine how agonizing it was and is to feel like you couldn’t be there right at the end. I wish you a healthy and happy rest of your pregnancy (which I know has been no walk in the park). What you are doing is hard work, and I have nothing but the utmost respect for you. Gah also I know it’s Maddie not Maddy! Oh honey! This just makes me weep for you… You go ahead and have a long deep cry if you want to…lord knows if any of us were you, we’d need to! You’ve been so much in my thoughts and prayers and now even my dreams…heavy on my heart, I suppose you could say. Please know that you are remembered and loved and not alone and while we look forward with you to welcoming your Acrobat, your precious Maddie has not been forgotten. Nor has your sweet friend, Jackie! We remember and grieve with and for you those who ought to be here with you but aren’t. Yes, you do need a good cry and you deserve one, so let loose! After I read your post, I just let out a deep sigh. As a mother of two daughters one of whom is pretty much the same age as you, my maternal instincts just wanted me to give you a huge hug. I know there’s nothing any of us can say to make you feel better, or to take the nightmares away, but just know that we are here to support you and give you an ear (or should I say eye) when you need to express your thoughts, whether they be good or bad. I hope you know how amazing you are, and what an inspiration to others, who may be going through hardships, your words have become. Be proud of yourself, because we are all proud of you. My heart literally aches for you. I don’t know what else to say. I feel physical pain which is nothing compared to your pain. I just want you to know that we are all thinking of you. People all over the world read your blog and are deeply for you and your family. I don’t want for this to come across badly…. But since my 5mo was tiny, his eyes and smile…remind me of Maddie. 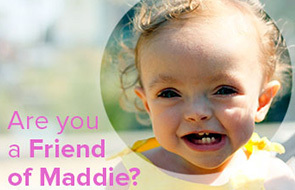 I don’t see myself or hubby in it, but I see unforgettable, brilliant Maddie smile. Her eyes, her eyelashes. Somehow, I feel her spirit, her love and her pure being just touched the whole world. She will NEVER be forgotten. She is loved by those who never met her and who still cannot believe she is not here bossing around her little sister and eagerly waiting arrival of a new sibling. A man I noticed from the other side came over to where I was. He said he had extra coupons. I said, Thank you, that would be awesome and it’s not even Christmas! He said. “You’re welcome!” As he walked back to where he was, his wife handed him a purple balloon. March of Dimes was having a fundraiser. I took a picture on the spot of the purple bucket filled with lollipops because I thought of you, but we don’t text so I couldn’t send it…haha. Maddie was there, of that I was sure! Love and prayers to you……..and have that cry. Ugh – how awful to have nightmares about your beautiful girl. Have you ever read “Many Lives Many Masters” by Brian Weiss? I find his books very comforting. I have another dear friend who lost her son 3 years ago and she actually saw Dr. Weiss in office and went to a seminar and it has helped her tremendously. I held our first son, Jake, as he took his last breath. I did not hold Sawyer when he died. They are both the worst days of my life and even as I write this I cannot believe this is really my life. There is no good way to have your child/children die. I wish neither of us had to even think about it let alone live it. I also wish for Jake and Sawyer to visit me in my dreams. I would again agree with you – I will take no visits over nightmares. There are too many real life nightmarish images that are forever burned into my memory. So much love being sent your way from Chicago. I’m so sorry, Heather. One of the symptoms of pregnancy for me is vivid, terrifying nightmares. I know how they affect me and affect my day – they stay with me all day, even into the evening. I can’t imagine how it would feel to wake up from a vivid nightmare about Maddie and to be scared to go to sleep for fear you’ll have another one. I’m so sorry and am thinking about you. I’m so sorry you are going through this, Heather. You seem to handle things with such grace, even when it’s so much more than anybody should ever be expected to handle. I hope you get some relief soon. Yes, cry. And scream. There is some catharsis. It (obviously) doesn’t change anything, but releasing the control for even a few minutes may offer your body and soul some small measure of rest. I’m so sorry. Thank you so much for that last paragraph. I have suffered from chronic depression, anxiety, and panic since I was a sophomore in high school (I’m now a junior in college), and sometimes I feel like I just need a good cry, just to let the emotions out. And sometimes, I feel guilty for wanting to do so. I feel like I should be able to handle the emotions, not let them get the best of me. But then I have to remind myself that it’s okay to cry, it’s okay to be weak, and that letting my emotions show in no way, shape, or form means that I’m letting the depression/anxiety/panic win or take over. It just means I’m human. Thank you again for posting this. Wishing you, Mike, Annie, and the Acrobat the best. Sending prayers your way so that you can have your good cry, be weak for a moment, and then have those nightmares go away. I had vivid, awful dreams when I was pregnant, and I don’t have nearly the bad things to contribute that you do. Take the time you need, and do have a good cry. I will add to my prayers that you have no more nightmares, *and* that you have a beautiful dream of your sweet Maddie where she is full of joy and light, as she always was (and will be). I’m so sorry, Heather. You are always so strong, but I imagine it must be so hard dealing with grief on top of raising Annie and struggling through a tough pregnancy and all your other responsibilities. There must be very little time to fall apart, to cry, to process your feelings. I’m going to pray, in my non-religious way, that the nightmares stop and that your beautiful blonde 5-year-old comes to see you. Let it go, sister. You just need to let the tears come, especially if that is what your gut is telling you to do. I can’t even begin to tell you how horrible my nightmares were after my baby daughter died, and I was pregnant with the next one already. I wish I had the means to de-stress myself back then, as I would now. Maybe go for a pregnancy massage to at least treat yourself. After everything you’ve been through, you deserve at least that. I think everyone that loses a child thinks about death a little more than normal. I know that has become my normal. Take care, and I hope the nightmares go away. My thoughts and prayers are with you for some peace of mind, body and soul. Oh Heather! Yes you do need a good cry. I had a good cry last night about my precious Lauren, it felt good to let it out and I felt relieved for a short time but in the end it never goes away. I have only been going through this for 3 months and I think most days I am still in shock. I was at the gym on Friday and I almost passed out, the last moment I held my girl in my arms and the nurses said “she’s gone” replayed in my mind and I couldn’t breath at that moment. I try to tell myself how thankful I am that I had 6 years with her, but really it’s not fair that our girls don’t get to grow up. I sure hope Lauren and Maddie are having a grand time together. Oh, Heather. My heart breaks for you. I’m so sorry you’re having nightmares; I can only imagine they’re stress-related. But I hope they end soon and are replaced by the happy memories you have of Maddie, and that they play on an infinite loop while you sleep. Thinking of you and Maddie! I hope the nightmares end and soon you will only be dreaming of the happy memories of Maddie. I am so sorry. For everything. I have been plagued with nightmares lately, of my Aunt’s passing, and of the pain and suffering that is in the future for my Mom. I wish there was a simple way to get rid of the bad dreams, and make the good ones come to us. Heather I swear by the “ugly” cry. I too have had a lot of death around me it started in my 30’s and today I am 50 and there are so many battling cancer. BUT….I do take a mental health day every now and then – home alone and let the crying RIP! Just bawl it out…it really does help. It’s hard to walk around feeling like your going to explode in tears in any moment! DO IT! It helps. I started reading your blog just a month before Maddy passed. You were so funny and I enjoyed your humor(I came from Matt L’s blog). I could not believe when I read that Maddy was gone. She was so beautiful. You are gonna LOVE having a little boy! I read your blog every day…and I just want you to know that I’m so sorry about Maddy….as a mother I cannot imagine a bigger loss….I think you are so strong….but you go ahead and have that cry. When you write about her know that I cry with you! Sending much love and many hugs. No words, but I wish I could give you a hug! I’m so sorry you have to go through this, I can’t imagine how upsetting those dreams can be. Have you ever tried visualization? Visualing the type of dreams you’d like to have? Maybe do that as your falling asleep? Oh, Heather. I’m so sorry you are having nightmares. I’m sure the fact that your body is stressed, worn out, and full of hormones is the cause. I hardly ever dream of our daughter who died. Once when I did, I knew she was behind me but I was afraid to turn around because I didn’t know what she would look like. Aged? Alive? Dead? I woke myself up screaming. Dreams are powerful. I’m going to try to get back into lucid dreaming as a way to work through my grief. I am prone to night time madness. I’m even afraid to say that (n) word for fear of a trigger. If I watch a war movie or something noisy I will put in a kids movie to “trick my brain” before I try to sleep. I have wished so many times as I’ve read your words that we could carry a portion of your sorrow. Thinking of you and swatting at the nightmares from afar. Praying for your peace right now. Thinking of you dear, sweet Heather, and always, always thinking of your gorgeous Maddie girl. Sending you a big hug from afar. I am so sorry you are going through this. Sending prayers and hugs. I am sorry to read about your difficult dreams. I recently suffered a nightmare involving my family and we were being attacked by a stranger, my two year old was mortally wounded. The dream seemed so real and I was disturbed something was going to happen to us. Now here is the woo, woo…my suggestion for what it’s worth is to have a dream interpretation, perhaps later after your baby is born. Death in dreams are often about new beginnings, i.e. new life coming to you and your husband in the form of a baby. You and your husband have been through the worst any parent could imagine and our fears come out in our dream state. I’m not an expert and this is certainly not the forum to discuss further, but I found comfort and once I know what the images in the dreams represented I could work through them in my waking hours and did not dread going to sleep. Much love to you and peaceful nights over the miles. Cry, Heather, cry. The lack of sleep, the constant nausea and vomiting, the hormones, taking care of precious Annie…no wonder you need a good cry. My hope for you is that you have moments of joy that will carry you over the sadness as you wait for the Acrobat’s arrival. You are a wonderful mother. Be gentle with yourself. I just appreciate you sharing the on-going, never-ending world of grief. It doesn’t end, it just changes…thanks for sharing so much. I too suffer from anxiety and I was told that when your anxiety is at it’s peak you just need to ride it out like a wave and do whatever you need to do to keep your head just above the water, soon the wave will get to shore and you’ll feel like your not about to drown. So do whatever it is you need to do – a good cry does the world of good. Each night as I tuck him into bed, I pray with my younger son and part of that prayer is for him to have good dreams and good rest. We started praying for good dreams and good, restful sleep when (at age he was still waking EVERY night, and most of the time he said it was due to bad dreams. Since we started about 6 weeks ago, he has slept through the night without remembering any bad dreams all but 2 nights. From now on, we will add you to our prayers for good dreams and good rest. Hang in there, Heather. I know these times are engulfing and the feeling of not being able to shake off the terror is terrible. It will pass, but in the meantime, I wish you strength and enough moments of peace that you’re able to climb through! You and your wonderful family and friends are always in our thoughts and prayers and appreciate you sharing everything in this blog. I wish I knew what to say. I have started and re-started this comment so many times. I know my words won’t bring you the peace in your heart that I wish I could give you, yet I don’t want to *not* comment either. Your beautiful daughter Maddie has touched so many lives in her too-short time on Earth. She was wonderful, extraordinary and she mattered. The world is better for having her in it. I am honored to have “known” her through your blog and pictures. It is so clear how adored she was and continues to be. What a lucky little girl to be a part of such a special family. No wonder she picked you to be her mommy. I wish she was here where she belongs, in your arms. Sending you lots of love, always. I was just discussing with my friend about these wierd pregnancy dreams. I have yet to have a GOOD one…they have all been odd and freaky and unsettling. I hate that because like you said they mess with you the rest of the day. I don’t have the sadness of losing a child like you do, but oh man the dreams I’ve had are all centered around my 4 year old son and something awful happening. Such a rock-in-the-gut feeling. I’m so sorry you have to be haunted by the reality of those feelings. Giant hugs to you mama….soon you will holding your precious baby boy and hopefully these damn hormonal dreams will take a hike!